1. A great number of students from various State Universities and Colleges within Metro Manila marched along the former Mendiola Bridge (Don Chino Roces Bridge) to protest against the looming budget cut for education. 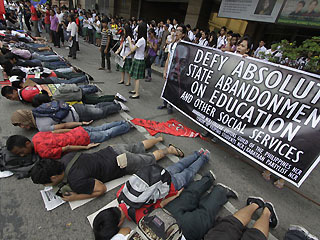 Protesters are clamoring the government (Aquino) to prioritize education over his love life. 2. In contrast to their advocacy, students from different schools in Metro Manila: State Universities like Philippine Normal University, Rizal Tech University, University of the Philippines Manila and Diliman, Polytechnic University of the Philippines and other private schools and high schools took part in the protest. They walked out from their classes to join the protest. They preferred shouting and planking along the streets over their studies. Huh? Ayos! Araw-arawin nyo yan. 3. According to police report an estimated number of protesters went around 1,000. The protest was said to be peaceful. In all fairness students enjoyed their planking. 4. Living up to their ideals, student activists, faculty members and activist groups who joined the protest will not tolerate the government to provide inadequate education and health services to the people. Aquino fresh from his business trip in the US responded with the good news of foreign countries lining up with their willingness to do business in the country - a great way to save up Philippine economy. In other words DEDMA. What to expect? A series of planking protests so soon. Multiple cases of minors involved in crimes. More surprising scenarios in SM super malls. And of course poor visibility in Aquino's love life. In summary the president's headache.